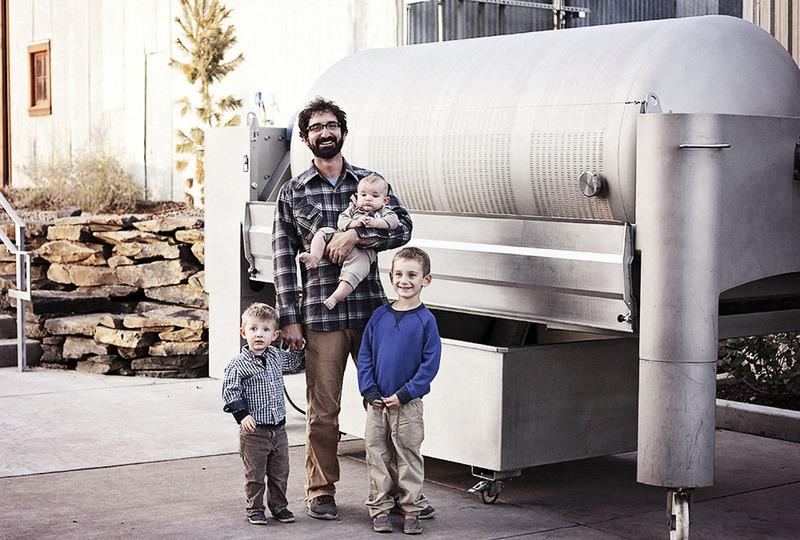 Justin Neufeld, owner of JB Neufeld, and his sons, Miles, Max and baby Jude. There’s something in the air. Something that has been fermenting for a long time, but now there’s a palpable excitement about it; you can see it, you can smell it, you can taste it. The West Coast is coming. Now most people will think I’m talking about California (again), but not this time. This time you’ll have to set your gaze a little farther north up the map, to places like Oregon, Washington and British Columbia … and call it the Pacific North West. Now the Pacific North West might not seem like a new or emerging region to many, but the three regions that make it up have been lying in the shadows of the larger and more popular southern west coast state for far too long. It’s their time to shine and show the world what they can do with the fermented grape. Here’s a brief look at each region and what it’s adding to the world’s wine-scape. Moving north from California there’s Oregon. Known mainly for Pinot Noir, they have found a happy medium between the fruit-forwardness of California and the Burgundian balance of acidity and earthiness, yet with a flavour all their own. The first planting of Pinot was in the late 60s and since then Oregon has exploded with winery growth — from a mere five in 1970 to 605+ today. Their key varieties are Pinot Noir and Pinot Gris, though you’ll also find Chardonnay and many of the other grapes you see in new world regions. Rouge Valley (the most southerly region growing 40+ varieties). “Oregon is such a great place to make wine due to three factors, the marginality of Oregon’s climate, the state’s exceptionally interesting geologic past, and the incredible patience and comradery of the winemaking community,” says April Yap-Hennig, Director of Marketing at Hyland Estates. Drive further north and voila, you’re in Washington, where winemaking history dates back a little further than Oregon’s, to the 1860s, but due in part to lack of sufficient water and irrigation techniques, in this semi-arid part of the US, and Prohibition’s impact on the commercial production of wine, Washington’s industry never fully got off the ground until the 1970s. Today it is the second largest producer in the US (next to California). Washington is noted for Riesling, Chardonnay, Cabernet Sauvignon and Merlot; but many say it’s Syrah that is making the biggest impact. Horse Heaven Hills (warmest sub-app with elevations from 90-550 meters). Cross the border and you’re back home in British Columbia, home to the Okanagan Valley, known to Canadian wine lovers for decades, but now the rest of the world is starting to take notice of the outstanding quality that can be found in BC, which remains one of the world’s most northerly winemaking regions; and it’s not just the Okanagan anymore, new appellations are being discovered and planted. Similkameen Valley (a growing appellations home to some 15+ wineries to date). “There isn’t anything else like it in the world,” says Miles Prodan, BC Wine Institute President. I’m sure that Miles’ words are echoed by all three of these regions. Hyland Estates owner Laurent Montalieu with winemaker, Anne Sery, and Bruno Corneaux, director of winemaking and viniculture. Delicate lime, pear and grapefruit pith and zest; very refreshing. Gorgeous and flavourful with ripe red cherry and yellow plum, there’s also a delightful herbal sensation mid-palate to the finish. Fruity and earthy with hints of tobacco, wood smoke and a long peppery finish. Yellow plum and pear with a seam that screams of minerality. Don’t expect California here, La Crema has made Oregon Pinot Noir in the Oregon style and has not tried to make it conform to the California ideal. Hits all those really good notes Oregon Pinot Noir is known for; supple fruit that straddles the dark, red, herbal, mineral and earthy — concentrated and delicious. Another California producer that has found Oregon; lovely black cherry and smoky aromas which follow onto the palate with floral notes adding depth to the fresh and fruity character of the wine; real true elegance here. The simplicity of this wine speaks volumes; nose delivers sour cherry while the palate is cran-raspberry and cherry with a spicy finish. A touch of Gewurztraminer is added to give this wine some sweetness and add some floral dept, and it works: fresh and fruity with mineral and peach backed by good acidity. Essence of blueberry skin, plum and vanilla with some meaty and floral tones. Plump, ripe blueberry, plum, chocolate along with some gentle coffee and floral. Menthol, sweet cherry, plum, violet, herbal, and mocha. A very pretty expression of Syrah with floral and blueberry notes, finishing with hints of chocolate and white pepper. Blueberry and vanilla lead the charge on the smooth palate with hints of chocolate-cherry on the finish. Aromas of cassis, black raspberry and herbal notes, while the palate mimics the nose in flavours along with mocha and loads of spice on the finish. Nose is the real lure here with raspberry, red liquorice and cherry; palate is silky smooth showing red berries, white pepper and anise on the finish. A six grape blend dominated by Cabernet Sauvignon along with Merlot, Syrah, Petit Verdot, Malbec and Carmenere; aromas of anise, spice and hints of smoke; palate is seductive with vanilla-oak, smoky-red berries and a peppered-sweet-fruit finish. Well priced for a BC red: nicely layered dark fruit, herbal and spice notes with great linger on the finish, but it’s the fruit that keeps this one rockin’. Meaty, raspberry, with a dose of white pepper, and some violet/floral notes quite delicate and delicious. At five years of age this wine is just starting to come into its own: oaky, smoky, cassis, black cherry and spice. A blend of Zinfandel and Shiraz from Canada’s West Coast that has a peppery-plummy sensation, could this be BC’s next big thing?